2019 Open Day events for Cape Town, George and Worcester Please view the attached doctor’s invitation for the 2019 Open Day events for Cape Town, George and Worcester. CPC/Qualicare related reading discs are available for those who require CPD Points and who were not able to attend our Open Day in Bellville, George and Worcester 2018.
from doctors registered for VAT, as to how they pass this increase on to their patients? NHC does not meet the relevant demarcation exemption criteria and needs to register as a medical scheme, to comply. Medscheme advises that MediKredit will be issuing 7 digit Nappi codes (10 digits including the pack size suffix) from 1 March 2018. This affects all providers and administrators and has been driven as an industry initiative by MediKredit. Please contact your PMA’s (Practice Management Applications) to enquire if they have adjusted their files accordingly? Please read carefully regarding claims instructions. Here is the first real alternative to Medical Aid, from IPA Foundation and Prior Vouchers. 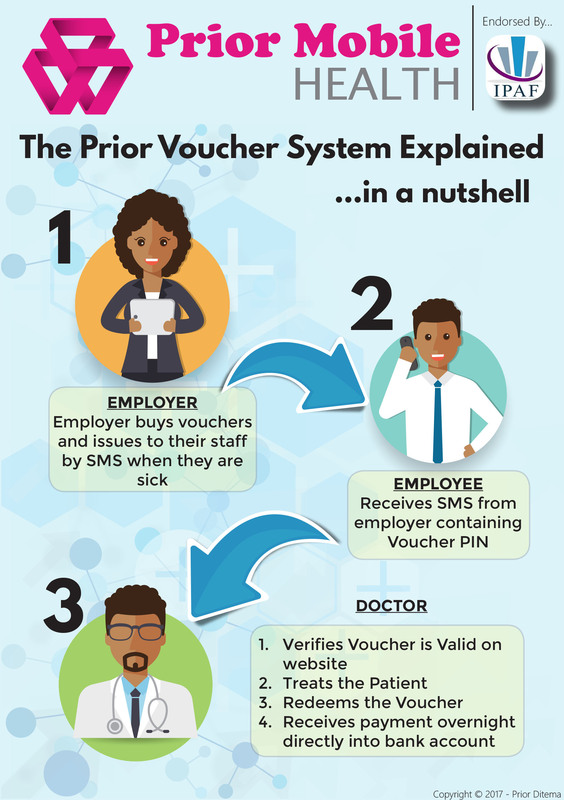 We are excited at the new concept of Prior Pre-Paid Mobile Health Care Vouchers, which can be used to pay for a consultation at the Family Practitioner without the patient needing to acquire or carry cash on hand. Prior Pre-Paid Mobile Healthcare Vouchers is worth R320.00 for a consultation in 2017. Limpopo – Three fraudsters who scammed Bonitas medical scheme out of almost R1.3m have been sentenced after being convicted of a total of 1 448 fraud charges. and you are NOT a DSP!!! 2017 sees more and more funder organisation forming their own networks of GP’s thereby turning you into a Designated Service Provider. Have you ever stopped to wonder why? General Ethical Guidelines for the Health Care Professions: Practice as a health care professional is based upon a relationship of mutual trust between patients and health care practitioners. The term “profession” means “a dedication, promise or commitment publicly made." The number and name for the poisons emergency telephone service available throughout South Africa has changed. Please remove your old numbers and replace with the above which is serviced by both Tygerberg Hospital and Red Cross War Memorial Children’s Hospital.